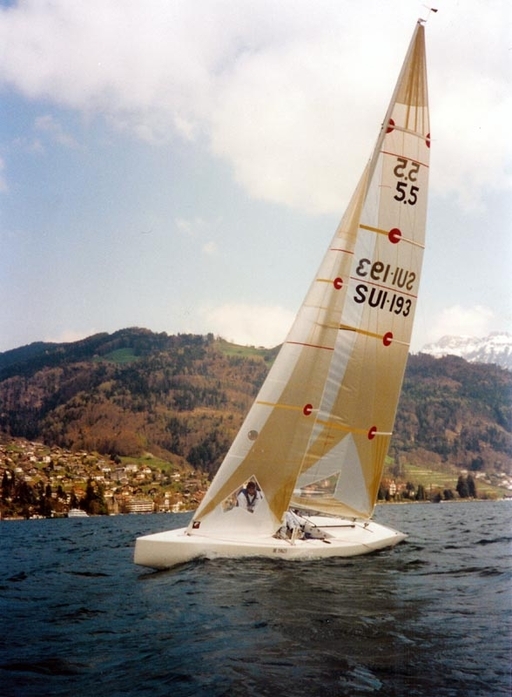 SUI-193 was a brand new and fresh hull design built by Josi Steinmayer during winter 1994-1995. The fundamentals have been studied together and in the same time with SUI-190 design, but while SUI-190 design was searching polyvalence and all around abilities, SUI-190 took another exclusive route (request from the client) to be focused to very light air. One unit only has been built from this design. This boat was distinguished by a very low area fin-keel fitted with a trim tab with very long passive fairing strips that was able to reconstitute efficient asymmetrical thick laminar wing sections studied by aero-hydro engineer Remi Laval-Jeantet (see picture). A funny (but sad) story from the first regatta : the boat has been sailed with the trim tab set to the wrong direction during all the week end, apparently due to a misunderstanding on the ergonomics of the trimming device. On Monday, Josi received the order to change the keel immediately for a classical one, without any further tests of validation with trim tab st in the appropriate direction... Too frustrating after all of these efforts.